E19 208-1/2 Zinc $ 3.80 / box Call for quote. E21B Brass Call for quote. Call for quote. E22B Brass Call for quote. Call for quote. E23B Brass Call for quote. Call for quote. E24B Brass Call for quote. Call for quote. E25B Brass Call for quote. Call for quote. E26B Brass Call for quote. Call for quote. 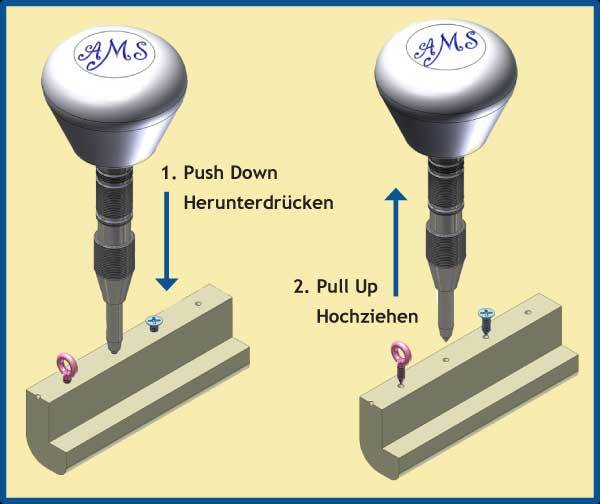 The new AMS “Puncher” is pushed into wooden mouldings to create a pilot hole ready to accept installation of screw or screw eye. The tip is hardened to be strong enough to push holes into hardwood as well as softwood. No mess of wood chips is created.